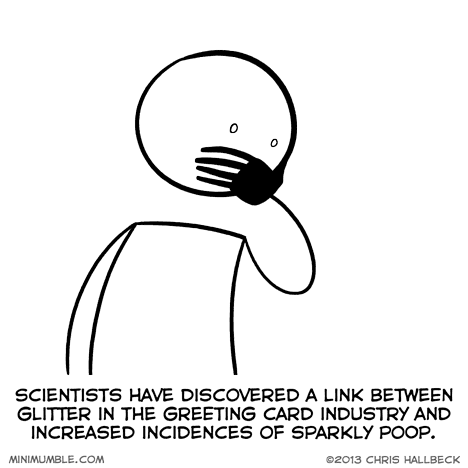 Please join me in signing this petition to ban glitter from greeting cards. Can we ban it from vampire movies too? No, see, that’s the sparkly poop referenced in the comic. Man how I despise that stuff. At least switch to the glittery sugar stuff they put on fancy cakes. I was at a wedding once where they sprinkled it all over the tables. Everyone had it all over them and in their food. Bad idea. You forgot to include a link to the petition. I can’t find it anywhere! Personally, I’m appalled by how long this poison has been allowed to spread during our most cherished holidays. …don’t forget the storys we used to scare our children with.